Welcome again to our Club News. Numbers still remain steady despite a number of dancers being away on holidays. Phil has just returned back safely after a 3 week trip to America in particular New York. So naturally he brought back some square dance gear such as bolo ties etc for some of our new dancers. Terry is currently on a 2 week cruise around Scandanavia, Phyl is also on another trip and Liz is in Queensland visiting family over the June long weekend. Speaking of the long weekend some of us travelled to Elizabeth to help Scoot Back Squares celebrate their 6th Birthday. It was a great afternoon of dancing, plenty of food for afternoon tea, congratulations and thanks for the hospitality. We are preparing to graduate our dancers who commenced in our learners class last year. It has been a long road but we got there so congratulations to our new mainstream dancers. 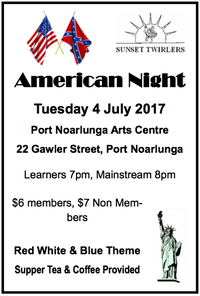 Looking forward to our next special nights which will be an American Night in July and A taste of Italy in August. Please see advertisements for more details. 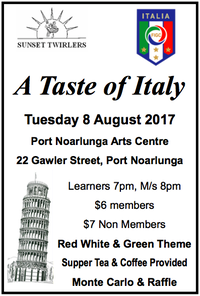 Don’t forget supper will be supplied so no need to bring any, hope to see you there.